The Octagon’s highly-anticipated primetime debut is just around the corner, and on Thursday UFC president Dana White revealed the final piece to the monumental puzzle. The UFC’s Facebook page will stream every “UFC on FOX” preliminary bout live. The November 12th event takes place inside the Honda Center in Anaheim, California. 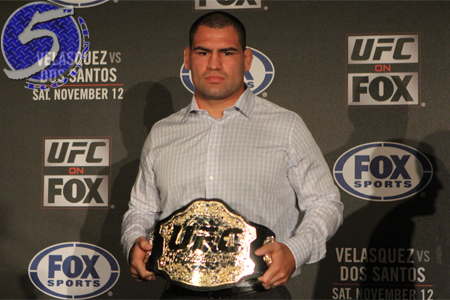 FOX’s broadcast begins live at 9PM ET/6PM PT and will feature a heavyweight title tilt between champ Cain Velasquez (Pictured) and Junior dos Santos. The 265-pound championship affair is the only contest scheduled to air live during FOX’s hour-long show. Up until today, it was unknown how the rest of the card’s scraps would be made available for viewing. White added that FOX.com will also host the prelims on their website. Furthermore, he mentioned that they had discussions with ION Television to show the preliminary card, but those talks fell through.